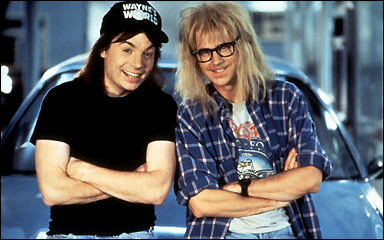 There is a profound teaching in the movie Wayne’s World. When asked by the evil Benjamin “How do you feel about making a change?”, Wayne’s friend and side-kick Garth responds in a deadpan voice “We fear change.” It’s a popular part of the movie, with thousands of references to it online, and like many jokes it has a significant truth at its heart. We really do fear change. We don’t know what change may bring us, and for many people that fear of the unknown is so strong that it not only stifles their growth and development, it keeps them in abusive relationships or jobs that they hate. For many people the security of the familiar, however unpleasant, appears preferable to the uncertainty of change. I recently took part in some training on the Solution Focus coaching methodology OSKAR, and I was very struck by the way that this approach is particularly effective in working to overcome our innate fear of the unknown. In demonstrations of the OSKAR approach I was struck by the way a whole session could focus almost exclusively on clarifying what the client wanted to achieve. Sometimes we’re so hung up on what we don’t want in our current situation, that it’s hard to see through to what we do want instead. Just gaining this clarity about the desired goal can be all that we need – a strategy and the imperative to act seems to naturally emerge from it. Of course different people have different responses to the idea of change, and different responses to life itself. In Buddhist psychology a simple distinction is made between what are traditionally known as ‘greed types’ and ‘hate types’. I usually explain this by asking people to imagine a buffet table at a party or event. A greed type will approach the table and have an internal discourse along the lines of “Ooh look, mushroom vol-au-vents, I like those … and there’s some nice looking samosas … oh, and look at the puddings!” because he (or she) pays attention to the aspects of their situation that they find attractive. In contrast, a hate type’s inner discourse will be much more along the lines of “I hate eating standing up … and I can’t eat chicken wings … and look they’ve put celery in the salad, I can’t stand celery … and those puddings are really fattening”, because they pay attention to the aspects of the situation that they dislike. When they look at the future, greed types and hates types imagine very different things: greed types get excited and enthusiastic about all the things they’re looking forward to, and hate types worry about how everything might go wrong! Greed types are natural optimists and hate types are inveterate pessimists, and as the pioneer of positive psychology Martin Seligman points out in Learned Optimism, optimists live longer, healthier, happier lives – albeit with an occasional tendency to naivety and seeing life through overly ‘rose-coloured spectacles’. Of course I’m exaggerating the differences here to emphasise a point. We are all greed types and hate types to different degrees at different times, depending on circumstances and how well-resourced we are. Nevertheless this simple model can be one of many useful lenses to look at our habits and help to address our resistances to change. Useful though the OSKAR methodology can be, the importance of clarifying your goal is fundamental to change of any kind. It’s not a new observation, but we seem to need reminding of it again and again. Back in the 1940s the Hindu teacher Swami Ramdas was unequivocal: although many embark on a path of spiritual development few make progress because most lack a clear idea of the goal they wish to reach, and they also lack a clear idea of how to get there. If you don’t like where you are now, then be careful to clarify where you’re trying to go at the very start of the journey, otherwise fear of the unknown may undermine your ability to get anywhere at all. Sry for being OFFTOPIC … what WordPress template do you use? It looks great. Thanks. There’s a link to the template at the bottom of the page – it seems to be called Tarski. The image is a photograph I took in Spain a couple of years ago, which I also use on my websites. I think you can insert any image you like into the theme.